Convolvulus Pluricaulis is the scientific name for morning glory or English speedwheel. In India, it’s called shankhapushpi. This bitter tasting Ayurvedic herb is prescribed for a variety of health conditions. It pacifies Pitta and Kapha. One of the popular shankhpushpi uses is boosting brain power as well as memory. The shankhpushpi flower reduces blood pressure. This herb also treats cough and cold. It reduces signs of premature ageing and improves skin health. This herb may also help manage depression. This herb can also treat insomnia. Doctors generally advise taking up to 2 grams of the paste per day for adults. Ant Bites: How To Get Rid Of Ant Bites & The Related Discomforts? You’ve Heard Of The Benefits, Here Are Some Triphala Side Effects Too! 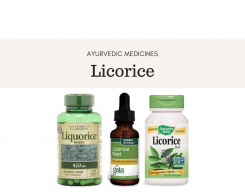 Uses of Licorice in Ayurveda – Everything You Need to Know!